Is it OK to sell furniture based on FWW articles? A reader recently e-mailed us to ask permission to make this garden bench, by Russell Jensen, and sell it. By asking, he was doing the right thing, and Jensen gave the go-ahead. I agree with Jensen that all designs are influenced by what has come before, but it’s not too hard too see that some are pretty unique. Take Sam Maloof’s rocker. He refined that design again and again, and so the design we all know and love represents any, many years of work, and a lot of money if you consider all the lean years a furniture maker accepts, hoping to find his or her voice and develop a signature line. When I was interviewing Maloof, I asked him about the many knockoffs I had seen. He didn’t mind hobbyists copying his chair. That’s why he explained how to build his rocker in articles and videos in the early years of FWW. But the case that upset him was a guy who set up a whole business around the concept of: Come take a class with me and I’ll show you how to build the Sam Maloof chair. Maloof said he had considered suing, but was advised it wouldn’t be worth it in the end. It would have been nice if the guy had at least asked. Recently, I have seen people selling plans for a “Sam Maloof-inspired chair.” I appreciate them inserting the word “inspired” and not copying the Maloof rocker exactly. That seems like it falls on the right side of the line. But what do all of you think about this thorny issue of copying and selling? 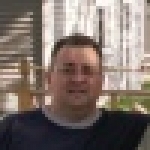 Scottg52 - While I understand, I think, the gist of your comment. It's a bit brash. And in all likelihood at some level a bit disingenuous. Albeit unintensional I'm sure. I hope you rethink and repost what I believe is your intended meaning. To paint everyone who's ever bought a plan, a magazine with plans, etc. an idiot is, is; well lets just say its a lot of things. I hope your posting was intended to be no more than a quip. I agree with most on this topic, that you should be able to sell what you make. also have a question about Asa stated: "The plans are in the public domain, but that is for hobbyists". What? does it state that some place in FWW? So, no pro's are allowed to build from plans out of FWW? A little out of time perhaps, but I only just saw this today and have a couple of cents to throw in as I once researched this topic extensively some time ago. A lot of my information was derived anecdotally so I stand ready to be corrected if necessary. Any kind of intellectual property - writing, software, plans, software, etc. - can be copyrighted by the simply means of affixing that little circular "c" symbol, the word copyright, and the year. With regard to furniture then, my understanding is that whatever the law, it all boils down to the notion that the reproduction of "common use" items really can't be restricted, no matter what anybody claims. So whether it's a simple wooden spoon or the most elaborated piece of furniture, voila. As for patents, that really doesn't apply here and is an entirely ball of wax. As for original works of art, it then boils down to "what's an original work of art?" I'm ignorant of the law in this area but I recall somebody saying once, turn the most beautiful bowl that's painted, decorated, pierced, inlaid, embellished, gilded, whatever, if you can fill it with soup, it's still just a bowl. Of course by that definition, which I believe is encompassed by "the law of utility," if you take the most simple bare bowl and punch a whole in it, then it's a work of art because it has no utility. As stretched as it is I hope I make the point. The act of affixing a copyright to one's work protects the intellectual property itself, not its use. If a plan is published as copyright, you can't make copies of it and sell them, that's a given, but you can do whatever you want, even if you follow the plan to the letter. If you want to stretch this point to an extreme, even if you use the same species of wood, its grain, coloration, workability, etc. is going to be different so it's not a copy of anything. 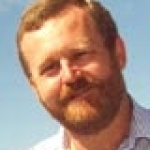 The people who say your use is restricted to making an 'N' number of "copies" for personal use or else so to spoke, can say whatever they want, but it has no meaning whatsoever unless the purchaser agrees to follow the originator's restrictions as a condition of sale (This is one of the reasons that software is never sold, but licensed for a limited number of uses - the purchaser has to agree to such restrictions as a condition of sale.. Some ago I purchased a few Toys & Joys plans with the intention of selling them - the toys I made from them - not the plans, and inquired of the vendor what his position was. He said very simply, "I'm in the business of selling plans. The more of my toys that you make and sell, the better it is for my business, so please, make as many of my toys that you can, sell them for the highest price you can get, and accept my thanks in advance." My understanding is that original designs can be registered. I'm in Canada so the laws may be different here. It is a relatively expensive process which can cost upwards of $10000, has standing in law, but really has no teeth that can be used effectively by the one-off or small scale designer/maker even if she were to choose to register the design. This issue is well-informed by the poster who talked about protecting a unique design element, and I believe this is where it applies. However for arguments sake, say you register a design and it's copied and mass produced by a huge corporation that derives huge profits from it. You can sue, and presumably, all things being equal you ought to prevail, but that corporation will use a roster of high priced lawyers to stall the process until you're either bankrupt or dead, hence no practical teeth. Of course, logic would dictate the questionability of doing so as any ethical corporation will likely arrange to license production from the designer and pay a negotiated royalty. Nonetheless, this is still a major issue being pursued by jurisdictions everywhere, witness all the cheap off-shore knock-offs and counterfeits flooding our markets. On a final personal note, why would I want to copy somebody's work and sell the copy? If I did that, people who know my work, would likely say "you should get a life because you have far too much time on your hands." 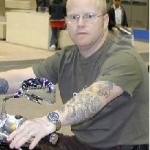 Conversely, if somebody copied and sold my work, not only would I be flattered, but I would start marketing my work with the cachet "you should buy my stuff because it's so fantastic, people all over North America are copying it, but if you buy from me, you will be the only person in the entire universe who has a true original." But if somebody "stole" my design and made thousands of copies and millions of dollars in profits then.............. I'm quickly comforted however with the notion that even if they sold only one of the thousands of copies they manufactured, then I would seriously have to question the good sense of the purchaser. To sum up then, for me it all boils down to a very simple point that seems to be the one most repeated in this thread. It's only fair to advise the originator of work you're building on of your intentions and as also pointed out here, the answer is usually an unreserved "of course you can - thanks for asking." It's not only ethical and courteous, but for me, a huge compliment as well. how about all the jigs we build from published plans; should we as permission before we build them? There are multiple issues here. First, is the creation of a product for personal use versus for profit. If the plans were placed in the magazine, then one would assume that the editors and the creator of the piece were expecting the reader to at least consider building the piece. I can’t imagine any author considering that the plans were just for studying. Let’s look at a the music business for guidance. You buy a CD. You’re an accomplished musician and can figure out “the charts”(the parts for all the instruments, in effect, “the plans”) for a given song. You hire your own musicians and singers and you “cover” the song. Somebody else’s song, but your people. You do it exactly like the one on the CD or you interpret. Doesn’t matter. The music is copyrighted, NOT the performance. On every piece of music, you’ll see a copyright. Copyrights can be renewed, but they eventually expire. After that, all bets are off. If you use the music copyright laws as the paradigm, then, IF the plans (or pictures) are NOT copyrighted, you can do anything you want, ethically, morally, legally. It takes no time at all to place a copyright statement on a set of plans and in this day and age, it would be hard to imagine that someone is ignorant of copyright concepts. In "the old days" a carpenter would intern at the shop of one of the "greats" and after studying and working, might go out on his own. His work would bare the unmistakable signs of his former employer, perhaps even copying pieces. That's the way it was done. But every carpenter has his own "hand" so his pieces, would look different, subtle perhaps, but different nonetheless. And people would couldn't afford a genuine Hepplewhite would commission a carpenter to make them something that "resembled" a Hepplewhite. The great Sam Maloof , rest his soul, built rockers with certain joinery, certain curves. He doesn’t “own” the concept of “rocker” but his implementation is a unique adaptation of that concept. If you attempt to build a Maloof rocker, going so far as to buying one and taking it apart (EXACTLY what is done in the electronics industry) and then decide to make some changes in joinery, it’s no longer a Maloof rocker. It’s now a reverse engineered chair that LOOKS like a Maloof rocker. Here, the issue is what’s morally right. Well you built the chair, without the benefit of plans, you made some changes, if nothing else, it’s an ode to Sam. If you’re good enough to do that, odds are you’re going to make some changes, because of your own slightly different design tastes. Today, you can take a piece of furniture, dismantle it, measure the pieces and then load the measurement into CNC machines (sometimes doing both at the same time) and the machines will produce a thousand copies of the same piece of furniture exactly the same as the original. Sad? Unethical? Maybe, but there is (rarely) anything we can do about it, so it’s really a non-issue. The laws in some countries are “flexible” (read: corrupt) such that that kind of thing goes on all the time. Movies, software, furniture, anything that can be copied, will be. But wait, isn’t there something that can protect great designs in woodwork? YES! Yes, if you can build something unique (not very unique!) to the extent that the design is unquestionably, unmistakable, you can actually attempt to protect the product. Example, you ask? The Eames chairs. Designed and originally built by Ray and Charles, the Eames Lounge (and its accompanying ottoman) as well as the Eames business chairs are still produced, under license, from the Eames’ estate and if you attempt to sell unlicensed EXACT copies and the estate finds out, you can be sued. The look of the Eames products are truly unique (I have the lounge and more often then not, when someone visits for the first time, they make the comment, "Oh, you have an Eames chair." So if a rocker, chair, chest, sideboard, etc. is clearly unmistakable in its design, it can be protected. Whether you want to go through that effort and perhaps sue those attempting to copy your work is a different story. One way around it is to in some way “sign” your work and have that signature traceable back to it’s originator. Like Prada bags and Rolex watches, they can be protected by design laws. But there will always be those that will copy items and those willing to buy the knock offs. That too, is clearly unethical, but there is rarely anything done unless the owner of the design has very deep pockets and is willing to repeatedly fight the copiers. The police in NYC often raid pocketbook/watch/clothing warehouses containing thousands of dozens of “Praba” and “Rilex” and “Barberry” items after months of expensive detective work on the part of the owners of the respective products. As to the specific implementation that started this, Mr. Jensen’s garden bench, look at it objectively. Other than the Tori inspired back, does this look “significantly’ different in any material way from any other garden bench. My view is no. It’s a nice bench. It’s a very nice bench. It would be a worthy addition to my or anyone else’s garden. But with all due respect to Mr. Jensen, it’s not an Eames chair or an Isamu Noguchi table (which I’ve seen in a couple of stores without the Noguchi signature on the glass and without calling it the Noguchi table). If, as Mr. Jensen said, he would be upset if someone had produced “large quantities” of his chair, then the plans should have been accompanied by a statement something like, “the owner gives permission to build the enclosed design solely for the personal use of the builder and any other use of this product including the selling of this product for any purpose is strictly prohibited without the express written permission of __________.” Someone might still make the copies, but Mr. Jensen can make his life uncomfortable by suing. Bottom line, if you want your stuff protected, copyright the plans and the design (if you believe it is unique)…that will probably protect your product from being mass produced by an Ikea or a Smith and Hawkins because they can very easily be sued and they will lose (or settle for a nice fee, in return for a perpetual license for the product), but will probably not stop a small shop from copying your stuff at your expense or a company in a foreign country from producing 10,000 exact copies. . Just the way it is. And by the way, do you have any unpaid for “copied”(read: pirated, illegal) software, DVDs, CDs?…your kids? First off, I pay for that magazine and anything within it is then my property unless copy written or otherwise protected in print in that magazine. Secondly how many of you are familiar with Norm Abrahm, and the comment on his PBS show that if you would like to PURCHASE A PLAN for this project ...etc. Of course he just went to a location and took pictures of someone else's work to take back to the shop to reverse engineer and draw the plan he is now selling. Or is there an age restriction on creation? Additionally, if I copy a plan, it is used as a base for a project. And when I sell the resultant project, I'm selling my interpretation, my craftsmanship, my hard work. If this doesn't hold true, we all owe royalties or at least credit for ownership to the first craftsman who rolled a log and conceived the wheel who is the real owner of the concept that was the root of the industrial revolution. I have created quite a few original items in my life, and have had others copy them (without asking) and without mentioning my effort. However, the copies are always better or worse, interpreted by the copier, not represented as my work (that, I would be excited about), and I take them as a silent recognition of a good basic idea. I say thank you to the copier, I hope that you can improve it and then I to will avail myself of your design when you make it public. This question began for me by: "eLetter: Ever rip-off a design?" The bias of FWW's editor is plain - "rip-off." If public domain is not public what is it. Instead of putting the ownus on the readers, shouldn't the publisher state any restrictions with the article, if any? Prior to this question being posed, did any reader question whether the product they paid for wasn't open to use as they see fit? I did not. If I was in the writer's shoes I would assume that my offering was being placed into the public domain unless I stated otherwise. As someone else has said, why publish if you don't expect people to use it? The publisher is certainly making money off of these articles, why would anyone think it wrong for the purchaser to do the same? I am all in favor of morals and standards equitably applied. This smells like nothing more than the publisher's attempt to create guilty consciences among their paying customers. Stick to woodworking, and in the future make any "legal issues" clear in the articles or don't play this game. 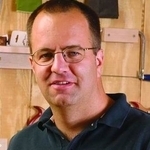 I guess my feeling is that it is very rare to find a plan in any woodworking magazine that is not at least in some way "Insired" from some other plan or style. Most have elements, jointery methods, or accents copied from furinature makers like Green and Green for example. To sit back and say that a design or a plan is so unique that it could be considered "Original" is nothing but hippocritical. Even if it doesn't follow a traditional style most techniques were learned either from some other woodworker or a magazine. These people took these ideas collected from other sources and built something new but for the most part not unique or original and were given money to have the article published in a magazine for all to see. Do they in turn, take a portion of that money and pay the sources of those copied elements a per diem. No of course not. That is the purpose of woodworking magiazines. To share ideas and designs. If woodworkers don't want there designs copied then don't publish them. i am a fairly young man at 32, but i am an old soul. i still believe in the "manors" that i was taught, and learned, as i grew up. it may sound cheesy but whenever i am doing anything that directly or indirectly involves anyone, or anything that has become of, due to a direct action or thought of someone else, i simply put myself in their shoes, would i want someone out there recreating my blood sweat and tears and putting their name on it? no i wouldnt an i dont believe anyone wants me doing that. things like this should go without saying, but in time and all the "not saying" people forget the message, we all need a refresher now and again. we are in this together! I have coppied the bench by Russell Jensen and sold one even before I finnished it,a woman saw it partly build in front of my shop and said I want it. The attraction of the design is the curve on the back and the arms,its a classic jappanese Tori gate design. I modified my bench to have those parts only 1 3/4 inch wide and I changed the slats in the seat to 10 pieces instead of 5 and made it out of red wood. I skipped the mortise and tennon,I used the domino for all joints. I just made 2 chairs in the same style(25 inch wide) and a 30x60 inch table. The bench picture is on my web site ( www.hdwoodworking.com ) and in a week I should have a picture of the whole set there. I have never sold anything I have made, but I have given them away as gifts. "Ripping off" a design? I have seen things made of wood pictured in catalogs and said, Hey, I can make that!" and I have done just that. A legal interpretation? If the plan is public domain, anything goes. The plan itself can be reprinted and sold. A project made from a public domain plan is the same. If, on the other hand, the plan is under copyright, no, the plan may not be reproduced for profit. The project? Copyrights only cover media such as print media, music, film and so on. You can copyright a design inasmuch as you can copyright the plans, but you cannot copyright a product of the plan. To protect the actual item, one would need a patent, which would be unlikely to be granted in a case like the rocking chair since a rocking chair isn't a new invention. If it was patented, unfortunatly, small changes in design could result in a new patent (improvements is a catagory for a patent). It gets more complex in the legal stuff, but basically, it's a moral call (remember morals?). I should think that it would be more satisfying to sell furniture of your own design, knowing that you didn't just put together a kit, you made it yourself! Here are my thoughts. 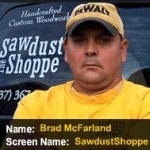 If a design is published in any woodworking magazine with plans and detailed text, unless it is copywrited or patented and the article says so, it is free game to any woodworker to use in any way he/she wants including selling as many pieces as he/she desires. I think there is a lot of foolishness here. If someone in New York builds a cabinet that someone in Florida sent in a design for and the person in NY sells the item to his neighbor, where is the harm. Unless the designer is planning on manufacturing and selling the items across the east coast, he is not harmed. If the designer were to be planning to market the product of his design, why is he publishing it in a wood workers magazine in the first place. On the other hand, if the Taunton is presenting the notion that it is unethical and wrong to see the handiwork created from a design in their magazine then perhaps the Taunton should switch to the legal publication arena and stop profiting from something that they oppose. If this is really their stance, I would not renew my subscription. If you have to ask yourself whether what you are doing is right or not it probably isn't. AS for what other people are doing, you probably have little ability to change it so don't waste too much energy worrying about it. I have two books about building puzzles each with a puzzle that functions the same. I also own a mass produced plastic version of this puzzle. Both books are by different authors, the puzzle is mass produced by a third entity yet a patent is issued to yet a fourth individual. The patent was issued in 1986 so I believe it is still in effect. All that matters is can you live with yourself? I subscribe to a number of woodworking magazines. The reason I buy so many is because I like diversity. Each has something different to learn from. Like a large number of us still learning, I build what is is offered. You can call it copying, I call it learning. Once I've mastered the concept I set out to build my own version of it if I find it worthy of being sold to someone. The problem comes when someone does it in mass production for resale. The "free plans" were not intended for that purpose. Sell your own version of it. In a sense we all copy, "originals" were built by our earliest ancestors, I don't care if it's a bookcase or a rocking chair. 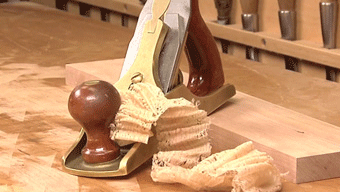 The "original" concept came from the early dawn of woodworking and were made out of necessity, not hobby. If it were not for the "free" plans, some of us would never have ventured into woodworking in the first place. I applaud those who offer their plans to others to build from. It shows the true spirit of woodworking. To the point of the question of the blog. It is absolutely okay to sell anything a person produces regardless of where they got the idea or inspiraion. Either by copy or my original design the wood the peice is made up of, the labor that went into making the piece etc is the property of the owner and anything I own I can sell. It is not okay to sell it as an original of another woodworker. That is fraud. FWW makes a profit by showing us how to do a certain technique. To then say we do not have the right to build it or sell that construction is not only ludicrous it is also a bit like a kid in a school yard who not playing a game they thought up also tells others who know how to play that game they cannot play it either. I basically agree with MikeCalo’s comments. IP protection exists so that innovators can profit from their innovations for a set amount of time, while making those innovations public knowledge so others can continue to improve upon them. I think, however, he may be confusing the copyright of a design (which as I have said does not exist) and the copyright of drawings. The drawings are protected to the extent that they cannot be resold without the permission of the copyright holder. Nevertheless, I think any individual who has obtained the rights of their use (through the purchase of a magazine) can make as many copies as he wants for his personal use, as long as he doesn’t redistribute them to the public. Most of this thread seems to have shifted to a conversation about what is original and what is a copy. Although we will never come up with detailed rules on the subject, allow me to suggest some guidance on how we use our terms in the future. If we build a piece of furniture that when compared by a casual observer to an “inspiration” work is best described as “the same except for [blank]” (e.g. building the Japanese Bench vs. building the same bench with straight back slats) we should refer to the design as “inspired by [blank].” If, on the other hand, the casual observer would describe the work and its inspiration as “two different pieces of the same type of furniture” (e.g. someone builds a Lutyens bench after being inspired by the Japanese Bench) we should refer to the new work as “an original design.” If a work is “inspired” then the craftsman should only charge for the time spent modifying the original design. If the work is “original” then the craftsman should feel free to charge the premium normally associated original artistic works. There will still be a gray area, and the comparisons will still be subjective, but it may be enough of a guide to put any ethical concerns at rest. What do you think? Thank you davidjt for defending the substance of my post despite its stylistic flaws. However, I must come clean, backhand is correct on both points: I did mean courtesy not curtsy; and the correct Latin phrase is sui generic not sur generic. Both mistakes were typos (not malapropisms even though the effect was the same) and were not intended as any type of double entendre. I appreciate backhand’s accurate clarification of my remarks (although not the sarcasm). Allow me to clarify some of my others comments, lest there be any further confusion. I wrote my post as a direct response to the original hypothetical question posted for this thread while prefacing my conclusions with general legal and ethical analysis. As a result, some of my pronoun usage may have been confusing. When I said “you” I meant the reader who emailed Asa Christiana. When I said “the bench” I meant the “Japanese Garden Bench” featured in FWW #198. When I said “the designer” I meant Russell Jensen. I think most people understood this. I think this discussion is preposterous. 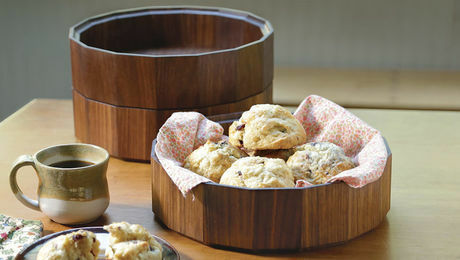 All design is derivative, based on thousands of years of woodworking lore and tradition. Next you'll be claiming you invented dovetails...or wood. Besides, why do we pay for plans, or your magazine? Should one produce - or attempt to produce - an exact copy of a design published in FWW - or anywehere else, for that matter? Of course not. However, when does it stop being a copy and merely an item influenced by a published design? If the original design is "based onan original found in..." or "based on an early 20th-century somethiong-or-other", then who is to say that someone else can't be so inspired? As otehrs have mentioned patents and copyrights in this discussioon, to presume to prohibit otehrs from using your design as an inspiration is akin to preventing people from improving on patented items or creating new works of fiction for Hollywood; if that were the case, we'd all be driving Stanley Steamers, riding on trains pulled by the Tom Thumb, NOT crossing the Atlantic - or even the United States - in airplanes, and still using Edison's light bulbs for illumination. In other words - and this goes for all woodworking publications that say nothing in their pages can be reproduced without written permission - get real and get over yourselves. Copying others' deisgns is going to happen and claiming owenrship to a design which is not 100% original is at best hypocritical and at worst illegal. If you're going to be so critical of the use of the English/American language by GeekyNovice, you might want to check your own wording first. Your use of "misnomer" is incorrect in this instance; you should have used "malapropism". Refer to http://www.merriam-webster.com/dictionary/malapropism and http://www.merriam-webster.com/dictionary/misnomer for details. Perhaps if we concentrate on the subject of this discussion thread instead of misspellings, trivial language issues, and ego-related items, we might learn more. Having said that, originality has many faces; not only in the design but also in the implementation of that design. 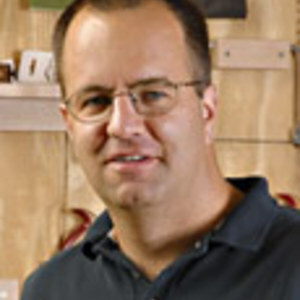 Joinery, fastening technology, assembly techniques, final surface preparation, finishing, and probably a number of other major facets of a woodworking project all contribute to the originality of the woodworking effort. Of course we should acknowledge the person(s) from whom we received inspiration for the project. However, if that idea is followed religiously, the inspirational pedigree of a piece of furniture could become rather lengthy - quickly resembling a medical or legal table of references. Perhaps each plan could contain a small reference section at the end with the major influences listed so the reader could more properly understand the genesis of the design and the construction techniques. This would afford all with proper and due recognition as well nicely improve the reader's ability to self-educate. After all, isn't the main reason behind such articles is 1) increase popularity of the magazine, and 2) increase the reader's portfolio of knowledge? This approach addresses both with a minimum of extra effort on the author's part. 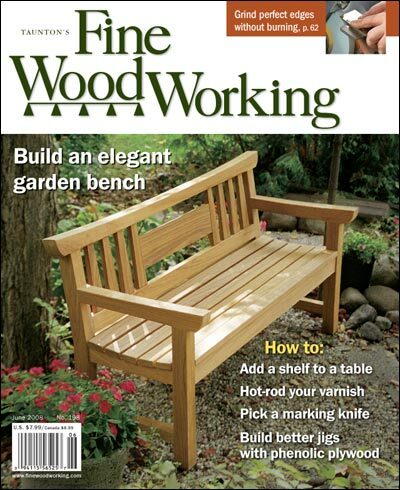 Finally, FWW, thanks for providing these forums and the finest woodworking periodical on the market. My Father (currently living with me and going to the shop every day - he's 96 and was a friend of Mr. Maloof out in CA) was a charter subscriber and we have an uninterrupted subscription to FWW. Quite a fine library!
" all's fair in love and wood "
It is a good thing that we do not follow the "do not use and sell your creation" in our evreyday life. Otherwise think of where the wood and canvas canoe builders, the many fly tyers, hotrod car enthusiasts etc would be. I draw and sell my drawings professionally. If someone takes my image and reproduces it mechanically they violate copywrite. If they draw my image and sell it with my name on it it is a forgery. If they draw it and sell it under there own name then the person who buys it has to judge the value of what they have boughten. Woodworking has a different aspect to it. A piece of furniture hand made by a good craftsman has multi-uses and value. It can be used functionally, at the same time it can be used as a piece of art (as in the design of the Sam Maloof rockers). Art enhances ones personal quality of life. To be able to touch, sit in or look at a woodworking piece makes each day I do it a better day. Most people could not afford to buy an original Maloof rocker. Also doubtful Sam would want to continue to make his design over and over again to fill every rocker wanted. Just calling it a Maloof rocker gives credit to it's designer. I have also seen a couple of woodworker designs that are very similiar in design but they had never seen Sam's work before or even heard of him. 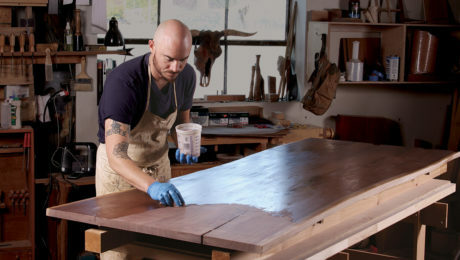 I also agree with the post that the huge majority of woodworkers do not even cover costs. 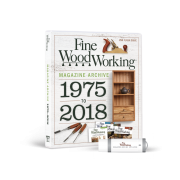 But as this magazine makes me realize every time I get one in the mail and read it cover to cover, the ability to see, be inspired by and admire others work and then go out and produce something with my hands in wood is a wonderful thing! Okay, so it's fine to publish an article by a professional woodworker making Greene & Greene knockoffs for sale, but not okay to, well, make a Greene & Greene knockoff for sale? Hmm. Yes, that was a bit tongue in cheek, I *do* recognize the nuances here. However, I just pulled a magazine randomly out of my collection. It is the October 2006 issue. 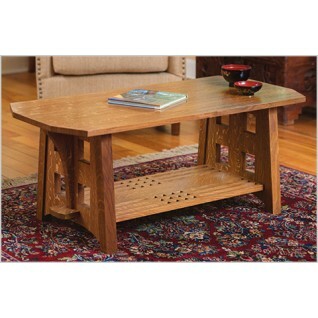 We have an article on an Arts and Craft side table, where the author writes it "dates back to designs by Gustav Stickley. A few pages later we have an whole article entitled 'Copying Museum Pieces'. Then we have an article named "Philadelphia Side Chair", which tells you how to build a chair in the Garvan collection at Yale. Then let's wander over to the Reader's Gallery. Julia Mclain, which google reveals to be a professsional, has a copy of a Normal Tooth Chest - she even went to a museum to copy measurements. Flip the page and we have a clock copied from a book. Then we have articles on carving a Chippendale ball-and-claw foot, and replicating a fumed oak finish. Flipping through the ads in the back I find classes on making Windsor chairs, kits for "authentic reproductions", etc. I'm not saying that excuses copying a contemporary builder's design (say, Maloof) for the mass market, but let's be realistic about the degree to which FWW encourages copying, and how much the professional contributors to the magazine copy. To me it doesn't matter if somebody looked at an mission chair and ended up making the arms 1/4" wider than the original, or whatever. Anyone seeing the chair would immediately say "mission chair". You copied, even if you used a dovetail where the original used a locking rabbet or whatever. I'm sure that the designer is well aware that in writing an article in FWW and including the plan, he is at risk of such a thing happening. But I do think it is unethical. Funny... I think it's kinda okay for a couple of pieces, but I wouldn't think it's okay if Target took the design and tweeked it and manufactured it in China, which is what they do all the time. For clothing and accessories, if not furniture. As a beginner woodworker, I buy plans all the time, and get them from Free Plans, and such, and try to build them, or change them a little to suit my needs. I am not able to design myself, I just don't have the knowledge or experience. And I look at furniture in showrooms and antique stores, like Norm Abrams, and see how things are put together. I'm trying to learn. I don't profit from them, but I see nothing wrong with learning from those that are more skilled than I. Furniture is my teacher! Copying is a way to learn. In European Museums, you often see people in front of paintings, copying them to learn technique. Learning from a master. Once you learn the techniques, you can go out and design on your own... that may be old fashioned these days... Me? I long to be an apprentice! This is a subject that I have struggled with for a long time. Some have said that it is okay if you have modified the original design. The question that then arises is, “How many elements of the design have to be modified?” If I use pocket screws instead of mortis and tenon joinery is that enough of modification? Instead of round-over edge I use an ogee, is that enough? Are there a set number of modifications that need to be made? Is there an unwritten rule that say after you change 5 elements the design is now original again and you own it? How about 10? Geekynovice uses the example of a making a bench. How many different ways can a bench be made? 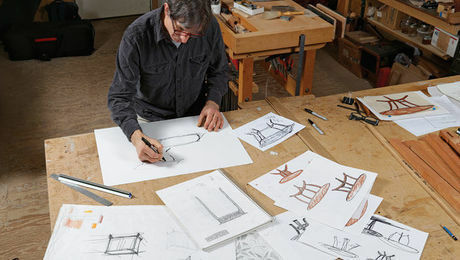 If you make a bench are you not coping someone’s original design somewhere within history? What do you do if a customer comes to you with the plans of someone else and asks you to build it for them, do you say, “Sorry not my design I cannot build it for you. Take it to someone that has no ethics”. Please don’t get me wrong I am not saying that it is okay or not okay to sell a piece that you have made from someone else’s plans. These are just questions that pop into my head when this subject comes up. It was once said: "imitation is the highest degree of flattery." with that stated if a designer of a project feels concerned that a fellow woodworker will "copy" their design, then don't publish it! once published should a individual "copy" and sell a piece, they should give credit to where the design came from and let the buyer decide if he or she wantsl to seek out the original designer/manufacturer. we are all of different skill levels. if i copy a Monet do i expect to receive the same dollar value as the original? by the same token if i can produce a piece finer than the original should i not receive a premium? assuming the buyer sees a value in "my" skill? the "grey area" commences with mass production similar to patent and copy right infringment. what holds true is the best never have to worry about not having a "job"! and an income level comenserate with the best! Most of the posts above have already captured what I my sentiments, ie. an inspiration is one thing, a duplicate or copy is another, but frankly, both have their place. When someone commissions you to create a copy of a piece, historical or otherwise, they want what they want, ie. a copy, not a version of copy, and almost always a single copy, so go for it, but do fully credit the original designer/builder. 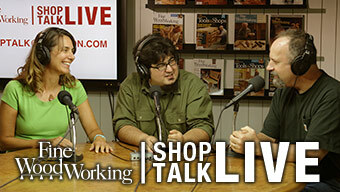 But the vast majority of what us woodbutchers produce are in fact inspirations from and not copies of. If it you have produced a truly unique design, wonderful, take full credit! But even then let's face it, there are really only so many ways to resist gravity and hold a human bum 17" or so inches, or a plate 30" or so off the floor? Other and scale and materials, how much different are the elevated stone slabs of Stonehenge from a table? So unless you are running a sizeable production shop and copying someone else's work without consent or credit, I say go for it, but once again, do credit your inspirations when they deserve it. Your customer will appreciate your willingness to learn from and be inspired by others. But I also want to make a point about even using the word 'profit' as it applies to what most of us do. A 'profit' is what is left over after all the costs of production and marketing are covered: all the wood, the finish, the heat, light and power, the tools and all the labour, including the cost of gathering the materials, time spent designing, building, finishing and packaging as well as delivering the finished product to the customer and the time spent doing the books and banking. You only have a 'profit' if you still have money left over all of that, and I'm willing to bet darn few of us find ourselves in that boat too often. That really only comes about by running a production shop of some reasonable scale with paid employees producing copies, inspirations or original designs for a sizeable market. For the vast majority of us, the best you can expect is to pay yourself wages, and frankly, that's enough, because being able to earn a living doing what you love doing and would do whether or not you got paid, is not too bad a way to live! All most of us are really doing while producing a piece for sale, is being compensated for the time that we commit to the total, some better than others, but few can honestly claim to have made 'a profit'. "But the case that upset him was a guy who set up a whole business around the concept of: Come take a class with me and I'll show you how to build the Sam Maloof chair." This isn't really a copyright issue, it's a trademark issue. The fix for this would have been to trademark the Sam Maloof name (as it applies to woodworking and related accessories) and possibly "Maloof rocking chair". This would prevent others from trading on the Maloof name and reputation. 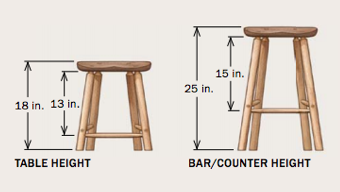 With the protection of a trademark the woodworking instructor would only be able to say "take my class and I'll show you how to build a chair." "Is it okay to sell furniture based on FWW designs?" My answer is "yes". It is okay to do it, and I don't believe there is an ethical concern unless the design is labeled as "unique" or "original" or otherwise indicates ownership/creation of the design. The assumption being that, when you purchase FWW magazine, you are also purchasing the plans and design tips/tools that it contains. Of course, we are all intelligent enough to understand that FWW is geared towards the hobbyist or one-man shop, and that these plans are not being offered for Ikea-style mass production. As for the reader who claimed that "only an idiot or third-rater even considers copying anything...ever!!" I'd like to ask how he managed to design his own language and alphabet to match the English language and alphabet so precisely. Certainly he didn't copy any aspect of English or the process for writing English letters and sentences, because that would make him a third-rater. So, however he managed to do it, I'd like to give kudos for a truly unique and monumental achievement. According to the appraiser of my 170 year old butler's desk, there was a time when most English cabinet makers would refuse to produce anything that wasn't in the guild's pattern books. I've never built anything from someone else's plans. It's not satifying! But I have built things from pictures of other peoples work, and called it my own. Because it is! If compared side by side and piece by piece they're two entirely different projects that look similar. We're all inspired by what we see, it's what keeps us fresh and challenged in our skill and trade. My client come to me with pictures and drawings of what they want, I use my skills and talents to produce it. I've been ask by others for plans of my work, and simply replied, "If you need the plans your not skilled enough to copy it, and If your skilled enough to copy it, You don't need the plans! If you can't make your own version, sell your tools, take the cash and buy what you wanted to build. Then sit back with that feeling of self reward and say "I bought that with my tools". I am a professional Industrial Designer. I have done silversmithing, sculpture, watercolors as fine art also. My opinion: The key word is Evolution. All art or design is an evolving thing. That is why we have "periods" of painting or furniture. Then something in our environment causes or forces or injects a new direction. Sometimes the changes are subtle over a long period of time. The first few years, homes built by settlers on this continent where very different that their european homes. They used what was here, possibly influenced by the Indians, definitely influenced by time and climate. As they passed through the survival issues they returned to their european traditions and adapted to new materials and evolved into some now classic periods of almost everything, not just furniture. There have been some interesting discussions in FWW on experimental design many done by students. Searching for newness at any expense including it's commercial potential. This is fine art at it's best. It will evolve over time and begin to influence all of us. In the mean time, especially if earning a living is important, we all work within acceptable norms that our spouses or clients allow. Reality. Ferrucio Lamborghini, John and Horace Dodge, Edward Murphy, Henry Leland, Alexander Winton, and Henry Ford are either idiots or third class citizens? All built their empires, while they lasted, by "copying" the products of a couple of now famous individuals; Karl Benz and Gottlieb Daimler, and a lesser known third individual, Wilhelm Maybach? The last three individuals are the inventors and designor of what we know today as the automobile. All of the others, and there are many more than those listed, all founded major automotive manufacturing companies based on (copying and modifying) the works of three individuals, one working alone and the two others as a team. I don't know where you are from, but where I am from, we call this PROGRESS! Perhaps the greatest landscape architect and garden designer of all time, Roberto Burle Marx, once taught a class of young architects and industrial designers and told them, "Never copy yourself, always copy someone else". His point was that to grow and evolve as a designer one needs to consciously look outside oneself for inspiration. The artist/designer who copies themselves grows stale and predictable (you have all seen the artist at a fair with a booth filled with the same painting done 100 slightly different ways). Copying, in the best sense does not mean ripping off every detail. Copying is simply another word for "inspired by". The Japanese copied Detroit but vastly improved on their product. The Chinese copy our alternative energy innovations but are vastly improving upon them. If one wants to prevent literal rip-offs by mass producers, then copyright them. Otherwise, enjoy the exchange of ideas and grow with the rest of us. I am a graphic design and fine woodworking hobbyist. As a graphic designer copyright and trademark issues arise often. As many have stated here already everyone's work has influence from something, this is how we learn. We study those before us to learn techniques and best practices. What we create using all our learned techniques and our own minds can rightfully be called our own. If someone were to take a design of mine and mass produce it in an attempt to "get rich", it's both immoral and unethical. With my woodworking I build from others plans to learn and enhance my skills, and from that I take all my influences and create my own works. The results are pieces I can take pride in knowing are my own. After all, how can you take pride in succeeding using something you didn't create. I challenge everyone to be creative, combine all your influences and inspirations and continue to fill the world with new unique pieces of fine woodworking. Because, if someone else has already done it, who wants to see it again? Not me...I want something new and different. Nothing I ever built from plans ever came out as "planned"! Like many posts below - it is about adapting to suit circumstance. If you check my name in the Gallery you will find I try and describe what influenced the design of the piece - and that can be an adaption of a FWW article, an integration of innumerable examined pieces or a simple table top with four legs that dates from time immemorial. For some time now my "bucket list" has included a rocking chair. One that actually fits me! I can't tell you the number I have sat on in furniture show rooms and at craft and wood working shows that simply don't. And yes - it would be nice if it looked "Maloofish". Prior to Sam's death I had started my research. I bought Hal Taylor's plans because he promised the secrets of scaling to fit (he delivers). I bought Charles Brock's plans because his chair is closer to my aesthetic. But it won't fit me! In the end I'm going to draw my own plans based on an adaption of Brock's lines scaled with Taylor's research. Both are selling a design they discuss as Maloof inspired (to differing degrees). Taylor makes no copyright claims anywhere in the supplied materials. Brock claims copyright on everything. In as much as either of them provide photographs, the work of producing lines on paper, text and video - I'll grant them copyright - even if not claimed. It would be egregious to copy all their material and then try and sell it. Do I agree that their design is "copyright" - no I don't - they freely acknowledge their inspiration. In fact they would need to make a claim that they had sold me only one licence to produce one chair before we would be getting serious. To be fair to them - I don't think either ARE because each details how to make the patterns long lasting enough for re-use. Taylor even recognizes you might set out to make money from them as a justification for what he charges. If I am actually completely mechanically copying to the tiniest degree - your plans - because they made my life easier - then I think you are entitled to a commission or royalty payment. If I am adapting and adjusting from mankind's integration and synthesis of all that has gone before to suit the client (usually me!) I am entitled to all I earn! Only an idiot or a third rater even considers copying anything,...... ever!! Never copy, never follow, never even get close. What about our cars, our homes, electricity, all the technology we all enjoy. They are copies of an original idea or inspiration that were improved upon and changed. Without that we would still live in a cave. Let me get this straight: For pay, someone writes an article, including plans, for publication in a magazine, which is sold. His plans include measurements and assembly instructions. And then someone wonders if some poor guy in his garage shop is going to build one of them? Don't publish your plans if you don't want them copied. You don't get the ego trip, but your item is protected from the masses. A professional craftsman friend of mine is very free with his information. He answers all questions honestly. He isn't at all threatened by my using his experience because he knows he could never be equalled by me. No master craftsman should begrudge someone's using his plans if the craftsman published them. What's the reason, otherwise? If you're as good as Sam Maloof, no one will equal your results. When I build a project I usually find I have pictures of several pieces each with elements of design I try to incorporate. Nothing I made ever came up looking exactly like the inspiration. To the point, since the plans are put in a magazine that you buy, I think you can build them dimention for dimention if you want and if possible , profit from your effots. What is wrong is when pieces are made to fool and passed off as originals or valuable antiques. Does your town have a furniture police? I believe it was Solomon who said, "There is nothing new under the sun." 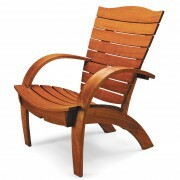 Sam Maloof's iconic rocking chair was copied in part from Danish furniture with it's sculpted flowing lines. The 18th Century Masters built their furniture from mostly English designs which were copied in part from French designs. Chippendale did not invent the designs in his "Director", he simply copied others, embellishing them and drawing variations of each piece. The Ball & Claw, so associated with Chippendale furniture was not even in the "Director" but is a Chinese design. Does anyone here use mortise & tenon joinery, dovetail joinery, practically any type of joinery you can imagine? Well, you are copying someone because those joinery methods have been around for centuries. If you don't copy, you can't build furniture or anything else for that matter. I'm a hobbiest but I sell the occassional piece to supplement my tool budget. I sometimes build from plans and I often modify those plans to suit my fancy. If I do it long enough, I'll eventually come up with a "new" design that I can call my own, even knowing that it isn't. So, to ask permission to copy a plan is courteous but not doing so is not unethical, IMNSHO. Has anyone ever asked the Shakers to build furniture that was inspired by them or copied? I know of a few very prominant businesses who have made their living from copying their designs. If I were to build a table with four legs and a top, is that copying? I have been in the furniture making business for fourteen years and have modified designs, but I can't say I have ever made a piece from a plan to sell. There is so much information and communication in today's world, how can we help but to copy another's work in one way or another? As far as originality is concerned, some things are great designs and should be left as such, copying or not! I consider the same issue when ever I visit a furniture store or check out furniture designs in magazines. On one hand I am always looking for ideas and on the other I don't think it is ethical to copy a design (especially to resell). I wish that I could afford many of the originals that I see, especially from Danish designers. So Scottg52, what then do you make? I'm probably an artist first and someone who could only at best be called a woodworking hobbyist. Having said that, I'd be pretty upset to have someone copy my artwork and mass produce it for profit without having some say it the whole process. Someone doing a one-off for a friend probably wouldn't be such a big deal. Just as I wouldn't want to go to the store and see my "stolen" design plastered all over mass produced t-shirts, I'm sure the same would apply to someone who had someone who worked hard to come up with some type of original design for some furniture or such. But then again, how different would a design have to be before it could be considered original? I've been in many stores that had what could be considered Greene and Greene "inspired" furniture but I bet no one is giving royalties to their family members, etc. I'm not sure what would be the best way to address this issue. Maloof didn't make the first rocking chair but what he did make was sure a beautiful piece of unique art. Timquinn's comments about copying are right on too. An interesting discussion nonetheless! I'm not good enough to copy, I would like to be but so far I have had to rely on my creativeness to make pieces or 'things' as they normally are. As a writer, and I don't know if it applies here, but we say that amateurs borrow ideas, professionals steal. 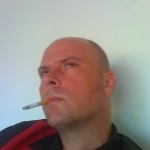 I doubt it is the same as there is no brotherhood in the creative arts as there is among woodworkers and bikers. but where would we be if one idea was not built upon another? without the first chair being copied/manipulated, there would be no Maloof, The only thing we do is build upon one another to make something great and useful. If we manage to make some money in the meantime without having to step all over each other to do it, even better. I would have to wonder what a person could come up with that does not consider copying anything ever, or follow or get even close. There are two very separate questions here. One is whether it is legal to reproduce a furniture design; and two whether it is ethical. There is a great deal of confusion about what is entitled to intellectual property (IP) protection (e.g. patent and copyright protection). In my opinion (I am a lawyer but not an IP specialist), the bench design is not entitled to U.S. IP protection. Without going into a long dissertation on the law, furniture (as a purely utilitarian article) is not generally entitled to copyright protection but individual artistic elements (like carvings) are, as long as they can be evaluated on their own merits (i.e. separate from the furniture). The artistic elements of the bench only make sense within the context of the furniture and are therefore not entitled to copyright protection. Many industries suffer from this oversight in the law including fashion designers and boat hull designers. As a result, the government has the ability to provide specific exceptions to the law in what is known as sur generis protection. Currently the US only provides this exception to boat hull designers. Alternatively, the designer may have been able to get a design patent (distinct from a utility patent) if he could prove that the design was “innovative” (which would be difficult in this case). Without one of those two protections, you can reproduce and sell the bench without fear of being successfully sued by the designer. Having said that, the question remains if it is ethical to reproduce and sell a bench based on this design. Well if you are simply building the bench and your client knows it is not your design, then I don’t have a problem with it (asking permission of the designer is a professional curtsy that we should all aspire to when practical, but it is not unethical to fail to do so). I assume you are charging them strictly for the construction of the bench. If you charge your client for the design without making significant alterations to the design, you could open yourself to a claim of fraud. Woodwork is copying in one way or another. If your building from a plan then you are copying. If you draw your own plans your unique ideas came from inspiration from past works somehow. Sam Maloof rockers are well known and a refined piece of work compared to mass produced rockers. His idea still came from looking at a rocking chair and making it better. Making minnor changes to a plan does not make it unique just a little different. Discussing where to draw the line as to what is copied and what is not could get to be like talking about poltics or religion. Everyone has a different point of view. Great comments here. I think Larry is right that I used the phrase "in the public domain" too loosely. I meant that the design and techniques are out there for everyone to see. The copyright and patent issues are complicated, though, when it comes to furniture design. My understanding is that there is a lot of grey area, and that cases can be hard to prove. This is a really interesting discussion! From the way I see it there are a couple of different issues here. First there is the issue of copying somebody's design or method of work, which I would think, needs to be protected by a patent. If there's no patent then there's probably no legal way to stop somebody from using a design for their own profit. There is, of course, the ethics that should be considered and I think that anyone who wants to use the plans and design beyond what the designer intended the use to be (for a hobbyist) then a request should be made to the original holder of the plans. 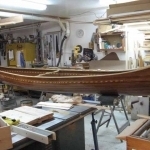 Whats even more interesting is that if you purchased a plan to build a wooden boat from Wooden Boat Magazine, most of the plans that they sell explicitly state that the purchaser of the plan is entitled to build only one boat. I think that is a very interesting piece of the terms and conditions of purchasing plans from them. And I would hope that this doesn't happen with the plans from FWW. I think we just need to follow a basic set of ethical guidelines and show respect for the original designers. Before a couple of generations ago you would not do any thing but copy others work for your whole life unless you were among a very small group of masters. Copying has a long and honorable history. Our fascination with originality is a recent development. Copying for personal use is no problem but for profit no way! And to call somebody who copies a idiot is not right. I do not have to copy but there are enough other persons who are starting out an learn from making these pieces of furniture. If the reader's name was Mr IKEA and he wanted to make say a thousand or ten thousand such products. Would that change the way everyone feels? I agree with everything you've said with one exception, and I'm surprised you said it. If the bench plan is "in the public domain", then you, nor Jensen have anything to say about its use. I doubt, however, that your publisher would share your opinion as they hold copyright over at least the layout and presentation of that plan. Jensen, unless he's relinquished his rights to FWW via contract, owns the copyright. Thus its use IS under someone's control. As the saying goes, "imitation is the highest form of flattery." I doubt we can find too many craftsman in any medium who do not have a pile of magazines/books related to their craft. What are these resources for? Sometimes copying an item helps improve our craft and along the way we may discover something to improve upon. It depends on the kind of person you are. Some love the work and some love the money. If you don't want to be copied, don't put your work out there for all to see. I think Russell Jensen´s answer said it all, we all find inspiration, ideas, and just plain cool projects in FWW and if somebody puts them together and sells a few, well, good for them because they built a beautiful object that somebody liked enough to buy it. On the other hand if a project is literally copied in order to mass produce it or funds a whole business then the builder needs at the very least be granted permission to do so or agree on some sort of compensation for the author. Projects and ideas will be copied and sold no matter what, if a how to article is printed it is expected that people will build the project. As a person who is new to woodworking (a little over a year), I tend to look for inspiration, ideas and techniques from the FWW articles. 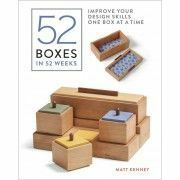 As a someone who wants to excel and make a statement in woodworking, I would feel as if I have cheated all the woodworkers who have sweated away years for their craft if I ever copied and sold a fellow woodworkers design and creation. To build upon another woodworkers design would be acceptable to sell as long as you gave credit and allowed fellow wood workers to build on your design and sell it. I literally read Sam Maloof's book this evening (found it at the local library) and was amazed by his approach to fellow woodworkers. 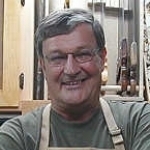 In the book, he explained that it would be wrong of him as a woodworker not to share his techniques with his fellow woodworkers as woodworking is a sort of a brotherhood in craft. I truely agree with sharing ideas and techniques but not stealing from each other. I hope to one day challenge myself by building a Maloof style rocker. For me as a newby woodworker, that would be the ultimate accomplishment and skill check that I could ever image. 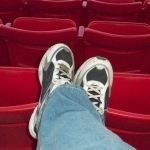 To be able to sit and rock in a well balanced, rocker would be a tribute to Sam Maloof and his many years of excellence. I understand that the economy and money are tight right now but we shoudln't bring ourselves down to cheating and stealing from each other. Stand on your own feet and hold your head up in life.